Artwork brings life to Goulburn Marketplace wall facing Sloane Street. Image: Goulburn Heritage Group. If you ask long-term Goulburnians what they love most about their city, do you think they would say its outstanding heritage? In my brief experience, any rare declaration of affection for our built heritage is matched by other local people’s contempt for old buildings, or warnings not to go near the heritage issue, for fear of restricting development, and therefore, the value of any given property. When I see an historic picture shared many times on Facebook, for example the Odeon Theatre, I wonder if it is nostalgia, rather than a love of Goulburn’s heritage which is motivating people’s interest. Much of the marketing material for Goulburn is wrapped in iconic images of Belmore Park, the Court House and Post Office. In the right light Goulburn’s image based on its heritage can be an important economic driver, compelling visitors to extend their stay in the historic city, and as a means for growing the population. This proposition is set out in the Goulburn Heritage Group’s latest project, “Goulburn, the city with a wealth of history,’’ a strategy which centres on embracing history and heritage with pride, to promote the image of Goulburn to visitors and prospective new residents. Of course before the message is taken beyond Goulburn, the heritage group must convince local people that this city’s history and heritage are major assets and points of distinction, and the first inland city status is a natural platform for this. Energetic and imaginative Linda Cooper and Daphne Penalver are leading the heritage sub-committee in preparing a presentation to do just this. They have pored over Local Government websites throughout eastern Australia, and found a benchmark in Ballarat. The heritage group showed the presentation to Mayor Bob Kirk, and Goulburn Mulwaree Council’s general manager, Warwick Bennett, and now plans to refine it and present its case to the Chamber of Commerce and other key organisations. The presentation shows how to re-invigorate the central business district with artwork and projecting digital images of original buildings onto existing facades. As well, the group recommends the council employ a heritage co-ordinator. 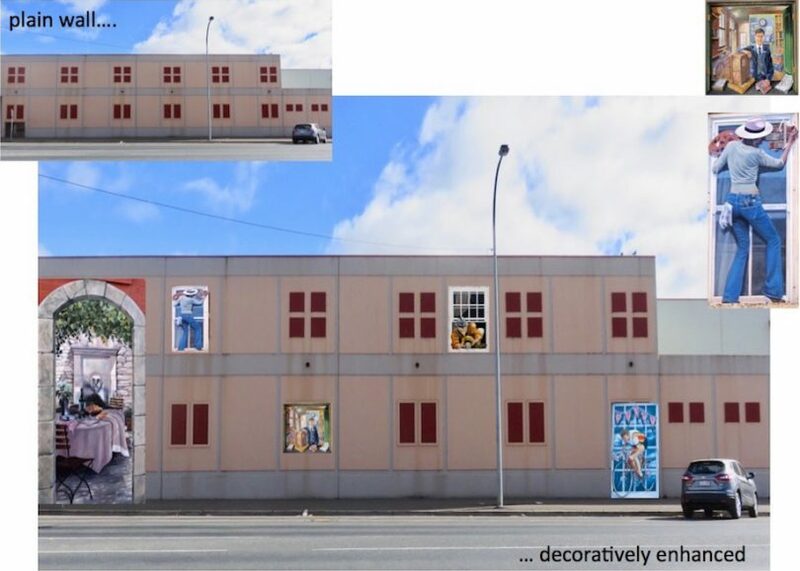 The group advocates turning bland, ugly CBD walls into art spaces. So Goulburn Marketplace facing Sloane Street, and Goulburn Plaza facing Clifford Street and the State Government Office block in Auburn Street become startling showpieces when superimposed with black-and-white images, for example, of Bradys Grand Central Hotel, including two levels of enchanting front verandahs. Belmore Park in winter changes from darkness into a sparkling, welcoming place with fairy lights strung through the bare tree branches, and the Goulburn Railway Viaduct (Mulwaree Ponds ) is floodlit, to complement the famous Rocky Hill War Memorial spotlight. Shopfront windows covered in corporate colours – for example the two pharmacies on opposite sides of Auburn Street – are replaced with eye-catching images of antique pharmacy products. Tapping on a phone app would enable visitors to hear the history of Chinese in Goulburn; the city’s Jewish story; State Aid battle; mining; railway; and fabulous wool stories. Mr Bennett says the council should visit heritage cities like Albury and Ballarat. He cautioned that digital projections would require exorbitant amounts of electricity. Cr Kirk says the council will re-assess its heritage approach, and the community should be engaged in what sort of heritage approach best suits Goulburn.